WASHINGTON – The number of solar jobs in the U.S. fell last year for the first time since 2010, but Arizona bucked the trend and remained one of the biggest states in the country for solar jobs, a new report says. Experts said they were not surprised by the overall 3.8 percent drop in jobs nationwide, since activity in 2016 had been unusually high, as consumers tried to beat the loss of a tax credit – which wound up being renewed after all. “Firms were trying to get the solar installed in 2016 because they assumed that was going to be the last year of the federal tax credit,” said Ed Gililand, senior director of the Solar Foundation, which has produced the annual census since 2010. The total number of solar energy jobs in the country last year stood at 250,271, a drop of about 9,800 jobs from the year before. the report said. Much of the drop could be attributed to the two states with the most solar jobs: California, which lost almost 14,000 jobs in the year, and Massachusetts, which shed more than 3,000. Despite the dip in jobs overall, 29 states ended up gaining last year. 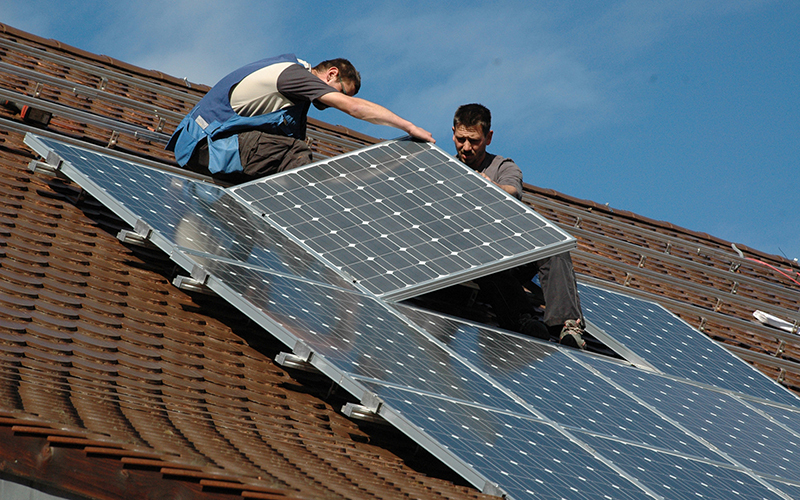 Arizona added 1,071 solar jobs to end up with the sixth-most among states. But the outlook for this year is less certain. The report projects that Arizona could see a 4.2 percent drop in solar jobs in 2018. Nationwide, industry officials are nervous about the potential impact of tariffs on imported solar cells and modules that were announced by President Donald Trump in January. He said then that the tariff, beginning at 30 percent and gradually dropping to 15 percent in the fourth year, was aimed at protecting U.S. manufacturers. But the move was immediately attacked by many in the industry, with the Solar Energy Industries Association predicting the tariffs would lead to the loss of roughly 23,000 American jobs this year. Steadily falling prices for solar panels had been one of the reasons for increased business for solar firms, the report said. Gililand said Arizona solar businesses could also be hit by the state’s decision to phase out net metering, which lets homeowners sell excess power back to the electric company. “I think in Arizona there has to be some concern looking forward because the state has done away with the ability to capture the retail rate when you sell your power back or your utility,” he said. Despite the gains in the state and the nation, the president of the Arizona Solar Energy Industry Association said the numbers are not so bright over the long term. “I mean what I’ve seen since 2005 is the state’s lost 2,500 jobs,” said Brandon Cheshire, president of the association. “We’ve seen companies that don’t even operate in the state anymore and have drastically reduced … their workforce in Arizona,” said Cheshire, who questioned the Solar Foundation numbers. But Gililand defended the report, which the foundation said was based on 59,300 calls and 35,000 emails to almost 2,400 businesses, of which 1,842 responded. Despite challenges, the report said Arizona will likely continue to do well because of the vast amounts of sunshine that fall on the state. Arizona had 3,399 megawatts of installed solar capacity in 2017, enough to power 506,142 homes, according to the report. The 3,629 installation jobs in the state were the largest category of jobs, but Arizona saw a 45 percent jump in manufacturing jobs last year, to 2,889 – the second-most in the country, according to the census. Sales, project development and other categories made up the rest of the jobs in the state.